Truck accidents are usually devastating since big 18 wheeler trucks usually weigh 8 to 10 tons (16,000 to 20,000 lbs.) When these enormous vehicles collide with a car, pickup truck, SUV, or minivan, then catastrophic injuries or death is usually the result. This is why it is so important for you to call the truck accident lawyers at the Griffin Law at 877-529-7070 or 877-PAIN-LAW. 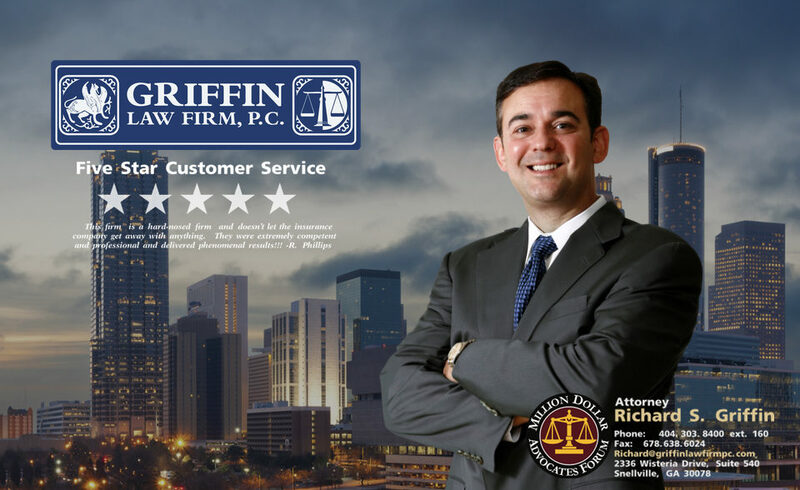 Atlanta truck accident attorney Richard Griffin has the experience needed to make sure you get the personal injury recovery that you need and deserve. How can our truck accident attorneys help you with your truck accident claim? Investigation is the key. A proper investigation is essential. Trucking companies and their insurance companies will deny liability if they can. The evidence needed to prove your case may disappear shortly after the truck collision if you don’t have truck accident lawyers fighting for you. You must be able to prove that they were negligent to be able to recover for any of your injuries or damages. 2. Proper medical treatment is essential. Medical treatment is the only way you will fully recover from your physical and mental injuries. Knowing the best doctors for your types of injuries will make sure you get the treatment you need. This will also mean that your doctors will know how to properly document your injuries for a personal injury claim. It is also important that your doctors are capable and willing to testify on your behalf if litigation is required. The doctors can testify about your diagnosed injuries, causation, your treatment, your pain and suffering, your work limitations, your permanent impairment ratings, your prognosis, and your future treatment plan. They can even provide projections of the cost of all the recommended future treatment. Our truck accident lawyers know how to get the medical evidence needed to make sure you are fully compensated for your claims. 3. Insurance verification is critical. Our Atlanta truck accident lawyers know how to identify all of the negligent parties and how to verify the insurance policy limits of each. Then we know how to properly stack these separate policies to maximize your recovery. 4. Great legal representation will make all the difference. Experience matters and the Griffin Law Firm has it. We have a track record of great results which means that we can negotiate and litigate aggressively on your behalf. We also have a rating of AV Preeminent from the Martindale-Hubble which is the highest rating for legal ability and ethics in personal injury and wrongful death claims. Negligence: A personal injury claim can arise from a truck accident when someone’s negligence causes injury to someone else. This negligence involve negligent drivers, negligent trucking companies, or defective or improperly maintained equipment. Damages: Once negligence is established, then the injured party can recover for their medical expenses, lost wages, pain and suffering, and when applicable punitive damages. When can a wrongful death claim arise from a truck accident claim? Yes. In fact about 11% of all auto accident fatalities are caused by commercial truck accidents. When negligence causes a fatality in a truck accident, then a wrongful death claim can be pursued. Wrongful death claims allow the surviving spouse and children of the lost loved one to recover for the value of the lost life. What often causes truck accidents? Distracted Driving Issues: When truck drivers attempt to multitask, it can be deadly. Truck drivers have a higher duty to drive safely since they are operating such enormous vehicles on our road ways. If a truck driver is driving while being distracted, then lives are at stake. Often distracted driving can include eating while driving, reading while driving, or the use of electronic devices such as cell phone, radio, or GPS. Driver Fatigue: Driving fatigue is one of the leading causes of truck accident collisions. This is because truck drivers are often paid by the mile and will often drive more hours than they should to make more money. Drunk Driving or Hit and Run: Driving while under the influence of drugs or alcohol is deadly. The reaction time and driving ability of truck drivers is essential since they are operating the largest vehicles on the road. If their ability to drive is undermined by legal or illegal drugs or alcohol, then punitive damages are often available. DUI driving, hit and run, or other egregious behavior can be the basis for punitive damages. Punitive damages are damages to punish or deter the defendant from engaging in shocking or bad behavior that puts the lives of others in jeopardy. Aggressive Driving Issues: Truck drivers often drive aggressively by making sudden lane changes and by driving too closely to the cars in front of them. Speeding: Truck drivers often speed to try to get to their destinations quicker. When large commercial trucks are speeding down our roads and highways, catastrophic collisions can result. It is critical that truck drivers drive slower when there is bad weather or heavy traffic. Driver Error: Truck drivers can cause truck accidents through other driving mistakes such as improper turns, improper backing, improper lane change, failure to yield the right of way, following too closely, and other various traffic violations. Defective Equipment: Tractor trailers are used to transport goods over large distances. This means that design and maintenance becomes critical. If trucks are not designed or maintained properly, then they will not drive safely. Failure to Maintain Equipment: Trucking companies must carefully maintain the tires, the brakes, the steering systems, and all other parts of the truck or they have breached their duty of safety. Improper Loading: If the tractor trailer’s load is improperly loaded, then the truck may not operate predictably. This means that it may be difficult to stop the commercial truck or that the truck may even jackknife and turn over. 10. Health Issues of the Driver: It is very important that truck drivers only drive their big rigs when they are healthy enough to do so. If a truck driver is injured or has a medical condition that makes it difficult to drive, then they should not be driving a big rig on our roads and highways. 11. Inexperience Drivers: Commercial trucks are complex machines that require experienced and well trained professional drivers. It is important to review the truck drivers experience, training, and licensing to make sure they are qualified to operate these commercial trucks. 12. Bad Weather: Truck drivers have a duty to drive in a manner that will keep us safe. When there is bad weather such as rain, fog, smoke, snow, or ice, it is critical that truck drivers slow down or when necessary stop driving. Bad weather certainly raises the duty of the commercial driver to drive more carefully to prevent serious injury or death to others sharing the roads and highways. Why are truck accident claims more complex than other auto accident claims? Investigation: Trucking companies and their insurance companies investigate these claims immediately. You need to our truck accident law firm to do the same for you. Preservation of Evidence: Our truck accident attorneys know how to preserve the evidence that the trucking company has. If this evidence disappears or is purged, then it is lost forever. This critical evidence includes both electronic evidence, as well as, written records that only the trucking companies have access to retrieve and maintain. The Griffin Law Firm can utilize spoliation letters, as well as, litigation discovery to make sure these vital evidence is preserved and produced by the trucking companies. Truck Accident Litigation: Our truck accident lawyers have the experience and knowledge needed to handle the complex issues surrounding truck accident litigation. Some of the needed knowledge involves the Federal Motor Carrier Safety Regulations, trucking business practices and safety procedures, insurance coverage for trucking companies, technology used in trucking, and other truck related rules and regulations. What are some of the important truck accident documentation and evidence? About 22,000 truck accidents occur in Georgia every year. About 300 fatalities result from Georgia truck accidents every year. About 4,000-6,000 injures are caused by Georgia truck accidents each year. 50% of the truck accidents were caused by tractor trailers. In fact about 11% of all traffic fatalities involve large commercial trucks. Free Truck Accident Consultation: Our truck accident trial lawyers will gladly answer all of your questions about your truck accident claim. During this free consultation we can explore with you what claims may arise from your truck accident claim. Some of these claims often include personal injury claims, wrongful death claims, workers’ compensation claims, or Social Security Disability claims. Call us today at 877-529-7070 or 877-PAIN-LAW to get the information you need.